A Diagram displays a view of Tables, Views, Materialized Views, various kinds of Relations and simple graphic objects - like rectangles, circles, lines.. 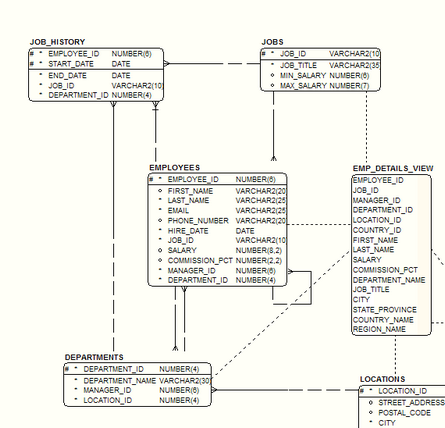 Which Tables and Views are displayed is determined by the Model Subset that owns the Diagram. A Model Subset is used to specify a subset of all of a Model's Tables and Views - allowing you to organize the display of your Tables/Views in whatever way you want. ModelRight provides an amazing variety of ways to display your Model. The following two Diagrams illustrate this variety. Both Diagram are contained in the same Model Subset (so they have the same Tables/Views) and use the same Notation (Barker), but they have very different display options: Themes allow you to change the look of a Diagram with a single click. A Diagram with its Diagram Display and Table Graphic options set to plain black and white options. The same set of Tables/Views and notation (Barker) displayed with more colorful display options. 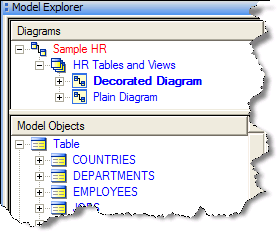 The Diagrams and Model Subsets are displayed at the top of the Model Explorer. 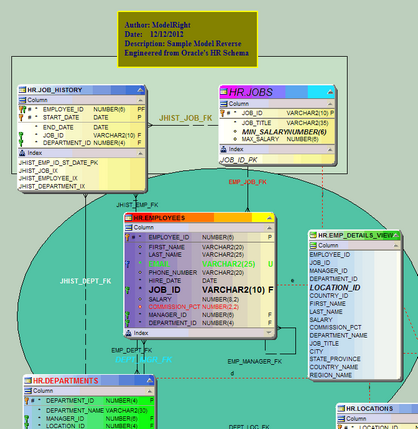 To open a Diagram either double-click on it or right click and select Open in the context menu.